This week I was minding my own business (literally) with Haley Salomon when suddenly we both plummeted downwards and splattered on the ground! My store was built on megaprims that stand about 50m above the raw ground. Picking myself up off the dusty ground, I looked around and saw nothing but bare land! Immediately, I thought that somehow my land, store and all my objects had been taken away by an evil land-baron-trickster-bot, or perhaps in an insufficient-sleep induced stupor I had marked the parcel for sale at a fractional price. But no, the truth was even stranger. I looked up to where my store had been - and it was still there! Somehow both of us had simultaneously fallen through the floor, all the way to the ground. Bizarrely, we apparently were standing on the ground in the middle of a solid megaprim cube. Having no other obvious course of action, we flew back up through the "solid" cube to arrive at the store's normal floor. Upon casually striking the "Stop Flying" button, I gently set down on my store's floor once again. And then plummeted 50m to splatter yet again. Somehow the megaprim floor had become Phantom - and I could freely pass through it. A furious investigation ensued, where I checked the phantomness (is that a word?) of the remaining floor cubes (phantomed). Store walls (phantomed). Any objects nearby (phantomed). Everything was made phantom! Perhaps, I thought, it's only my objects. I rocketed over to my neighbor, Aspasia Arliss's park and approached her house/temple/not-quite-sure-what-it-is, and being the clumsy oaf I am in a laggy sim, proceeded to fly right through it! All of her objects were similarly phantomed. Returning to my store, and gaining a slight bit of psychological stability by positioning myself mostly on the floor (see picture above), we set about figuring out how to report this unbelievable turn of events to the Linden Mandarins. Suddenly, I squirted upwards out of the floor to resume standing normally on the now solid floor. Other objects were also suddenly non-phantomed. So what happened? A SL Client problem? No, it happened to two of us at exactly the same Second Life second. Did I dream the entire scenario? No, check the picture again. Clearly it was a sim problem of some sort - and fortunately a temporary one at that. It does a business no small goodness to have arriving customers plummet to their death mere seconds after they arrive. Moral of the story: When you hear a big "Splat", it isn't always due to avatar operator competency challenges. During this past weekend the "monthly" SL Bloggers' party took place at Sailor's Cove, courtesy of hosts GoSpeed Racer and Ravishal Bentham. It was only my second party, and I really don't know many of the bloggers in attendance - yet. I had a fab time and I will report here for those who did not attend, or even those who did. Yeah, I should post a picture. But I didn't take any, as I was intimidated (and surrounded) by truly awesome Second Life photographic artists on all sides, and besides, in every direction I looked was a "gray" person. Sigh. 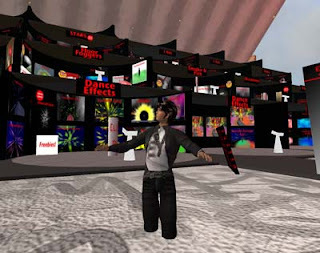 Unlike many events in Second Life where participants constantly say "WooT!!! @" or that awful "Yee-hahhh!" sound and spell terribly in chat, this event was filled with writers. Who know how to speel. Um, spell. And make puns. Lots of them. Veyron Supercharge and Tiessa Mongolfier dressed as ethereal fantasy mermaids, floating in the air. Well, at least until Veyron wanted to dance and suddenly lost her tail! Mylena Aquitaine appearing as a fish (hmm, which species was it? Tuna? Mackerel?) and Nobody Fugazi's flaming penguin avatar pursuing her in search of Fresh Sushi! Vint Falken whipping up a large bowl-shaped aquarium for Mylena. And the ultra-kewl Top Hat! Crap Mariner somehow walking sideways on the wall and not falling down. Some incredibly amazing music mashups by the DJ. Ravishal and GoSpeed, thank you again for organizing this! Oh, yes, I somehow forgot all about the "seamen" jokes! NOT. I thought it was time to revisit the data, especially after reading this paradoxical article in New World Notes. 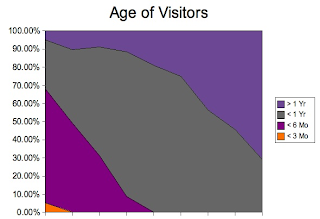 Here's the result in 2D graphical form: the customers are continuing to get older. Virtually no newbies come by, as the majority of the customers are now 1+ years old. In SL, I mean! The NWN article suggests another cause may be at work: there simply aren't as many newbies any more! Also, I suspect another factor may be at play. The new signups may have a disproportionate number of alts created by existing avatars, and they do their shopping with the main avatar that has the fattest wallet. We all do this, don't we? My observation was that shoppers generally seem appreciative when greeted by a live person, and often I was able to help people find and buy items they probably would not otherwise have found. Also, you'd be surprised at the number of people who come randomly to a store like mine. One recent visitor, Quanishia Tuqiri, has the bizarre habit of picking a random keyword, punching it into SL Search and then TPing to one of the search results. It turned out to be mine the night she came by, and after a lively discussion of many things, Quanishia is now a good friend. Visitors with no intention of shopping can often be transformed into customers with an explanation of your store's products. Another important aspect of live interaction is to identify the need for products that don't exist. Shoppers frequently TP through dozens of stores looking for a specific item. If you are there on duty, you can find out precisely what they seek, and sometimes even build products for them right in front of their eyes! This can't happen unless you or your staff are present. So I hired a very nice friendly face to work at the store. I set up a time clock and began paying hourly wages. Results were very unclear at first, because of the irregularity of SL shoppers - some days are good, while others are catastrophically bad. I decided to run the staffing experiment for a few weeks to see what happened over the longer term. Hourly (or by minute) payments are questionable. It's not clear whether your staff is actually working consistently even though they might be physically present, since its so easy to be busy IM'ing others. Meanwhile, someone may show up at the store and even slight delays in greeting them don't look good. Difficult customers are hard to deal with. Somehow I am usually able to successfully interact with even the most dreadful personalities by being very careful what I say and how I say it. However, not every one is able to do so, and in one case I received a complaint during the staffing experiment. Inspection of chat logs revealed a catastrophic miscommunication. Understandable, but still not good. Some customers just don't want to talk. Half of our visitors simply didn't respond when addressed. Perhaps they spoke other languages, or maybe they were in a hurry. Some were simple rude. Regardless of the reason, it meant that staff were not required to handle half of the visitors. Some customers talk too much! It's fine to be engaged in a discussion, but when things get busy it's often tricky to disengage from one customer and start with another. This always happens in real-life stores, and Second Life is no exception. But staff have to be able to do this seamlessly. Hah - in one case, a randy customer became overly interested in my staff and asked her "when they got off work". Will I hire staff again? Perhaps, but things will be slightly different. I want to organize a different payment scheme in which salary will be more directly tied to sales results. Not commission payments, exactly, but something close to that. That way the staff will have appropriate motivation to do the work. However, I haven't figured out the right formula yet. The hourly payment scheme attempted this month was just a bit too close to Camping for it to work effectively. Another change would be to train the staff in sales techniques. While many people may think it's easy to simply jump into a store and start selling, there is actually a science to selling. I have a real-life friend who teaches such skills, and I am thinking of engaging her to train any new staff with proven techniques. Over the past few months I've found that I am increasingly using voice over chat. At first when voice was unleashed on the virtual hordes, I wondered what the effects might be. Others thought it might be the end of the world. Still others welcomed it. I just wasn't sure if it was good or bad. I admit this: I was a little nervous about using it myself, since it strips a little bit of that anonymity away. However, after some months of use it turns out Voice is mostly useful to me. But for others, it may indeed be bad. Voice is simply much, much faster than typing. I don't care how fast you type, you cannot beat voice for the speedy conveyance of valuable information. Or taunts. Voice interactions are synchronized. What do I mean by this? Consider the situation where someone in chat is taking a long time to type a response, and during the delay we start on a new train of thought. We end up answering the question from two entries back and mix it all together, sometimes with hilarious, embarrassing or catastrophic results. This rarely happens in voice, since questions and answers are usually in sync. Voice is more than just characters. It carries tone and emotion far more accurately than chat. This might be important. Really important. Anonymity is compromised. Imagine the shock I felt when I discovered one of my female friends was outed as a guy! 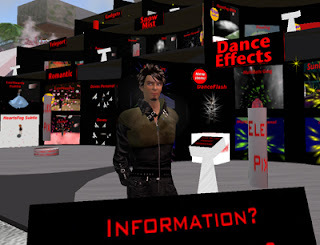 (Truth: nothing shocks me very much now in Second Life. Or Real Life either, for that matter.) Depending on the type of Second Life activities or role-playing you engage in, it may be impossible to do them with voice since the freedom that comes with total anonymity evaporates. Or maybe you just don't sound like a Dragon/Chick/Mafia Gangster/etc. Background noise. 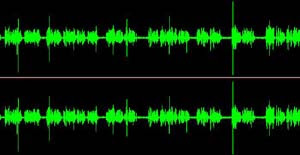 More than once I've had rather interesting voice conversations with people who suddenly have real life audio interruptions - be they cat, dog, spouse or spawn, it can completely destroy the moment. Suddenly you are looking at pixels again instead of your virtual friends. Isolation. This occurs when you have a group in which some are Voiceable, while others are not. The question is, who does what? Should the Voicers "degrade" back to typing to accommodate the typists? Or should the Typists listen to the voice stream and respond with their fingers? Sometimes the Voicers simply communicate on a different level (voice) and leave the Typists totally out of the loop. At first I found crowds willing to "degrade", but lately the occurrences of that seem to be getting fewer, as the Voicers get increasingly attached to voicing. Translation. Apologies in advance to Peter Stindberg aside, you cannot obtain automatic language translation while using voice. However, there are a few translation gadgets you can use that automatically (and often poorly) translate your text into various other languages. It's not great, but sometimes it's better than nothing. No such thing is available with voice. It's Busted. Yep, happens to me constantly. Drop outs, mic not working, etc. It's not nearly as reliable as it should be. So which side wins? Voice or Not Voice? There seems to be more negatives with Voice than positives. The only possible answer: It Depends. It depends on what you are doing, who you are with and everyone's ability to compromise. My advice is to simply make a sensible decision on each situation. Be sure to account for everyone's needs, because it does no one good to alienate others. And be ready to WEAR and DETACH your headset at any moment! What's your opinion of voice? I've met many people in Second Life, some from far, distant places and some terrifyingly close to home. There are those who speak other languages and those who just don't know how to dress properly. Some are new, some are old. Many are astonishingly nice, and a scant few are raving lunatics. But they are all, every single one of them, real people underneath those pixels. And we must never forget that. I like to observe people in an attempt to understand them. If I can understand someone better, I can become a better friend, a more effective worker or a more caring partner. Mostly people seem to act like they would in real life, or as they wish they could be via role-playing. Their actions are often predictable, or at least understandable in the same sense as you might expect a real life person to act if you know them somewhat well and understand the context they work within. You might understand if your friend jumped off a virtual building for the thrill of it, but you would not expect them to do things totally out of their normal character. But once in a while there is an aberration. Something out of the ordinary. Actions out of context. People doing things that don't quite make sense, based on my understanding of their personality. I observed a friend playing in Second Life. Moving around. Running around. Jumping. And jumping again. And again. Sure, it's fun to do that, but not over and over and over and again. I wondered a long time about that. About why they would do act that way. And then I learned the terrible truth. In real life my friend is disabled. In a wheelchair. And that is why they moved around so much. Doing what many do in Second Life: Being and enjoying what they cannot do in real life. And being treated as an equal, on par with anyone else in the world. Later, I learned another friend was also disabled. And another. Now, when I see people doing things “too much” I stop to watch. I don't comment or criticize their actions. Instead I think about them. And smile, for they are free of reality for a time. Some may say their life is tragic. Perhaps so, perhaps not. To me the real tragedy is elsewhere. The true tragedy is the disabled millions who do not or cannot transform themselves with virtual reality to briefly experience things that cannot be. They may not even realize the virtual possibilities they have lost, and I weep for them. And what of the disabled among us? Let's get this straight right away: I don't like vendors. No, not the fine people that sell things - I am talking about those Vending Machines one often encounters in Second Life. Often used by fine people. Why pick on vendors? Nightbird's comment on this post got me thinking about vendors and I couldn't resist. Vending Machines are very prim-light. In fact, a good vendor may soak up only a single prim, whereas your for-sale object may yank hundreds of prims from your measly parcel limit. That's right, you can't easily place that 4,444 prim Naval Aircraft Carrier for sale without slightly blowing out your prim limit. You could put it inside a vendor and avoid the pain. Or, just put it in a box instead and avoid the vendor entirely. 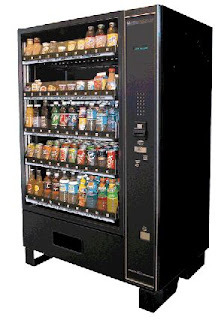 Sophisticated vending machines might offer networking capability, where they can simultaneously update and contain consistent sets of objects regardless of the locations where your 720 vendors were dumped on the Grid. In addition, some sophisticated vendors might offer reporting capability so you can track your sales. However, I've found satellite stores and mall locations to be extremely ineffective, so I have no reason to employ vendors in distributed locations. Payments may be split by a vendor into separate payments by multiple owners, where two or more people are to receive income from sales. However, this is often problematic, since a typical situation involves Maker A placing a vendor on Resident B's property. Who makes sure that the vendor's payment-splitting script actually does a fair split? A? or B? Who made the script? Who owns the script? Who can change the script? My enquiries about this scenario suggest that Resident B should simply rent space to Maker A by the week and avoid the problem entirely. So much for payment splitting. And I think that's about it for the good things. But what about the bad? Vendors suffer from rez-disease, that terrible affliction that occurs when you try to painfully page through each offering. The rezzing doesn't start until the new texture is exposed, which means you are constantly standing there waiting for the next pic to appear. "It's a bit blurry yet. I think it's a shirt. Yes! No. What does it say? Oh, it's a Moose. But I wanted a shirt! Argh, press the NEXT button... again!" So you give up and move on to avoid the tedium. After all, there are so many other great places to shop! This often happens because people are generally impatient, particularly when the Lag Demons are loose. You are frequently required to flip through many pages before you (might) find the item you seek. I've seen vendors with 20+ items in them. Does anyone actually expect you to page through all of them? Again, people are impatient and simply go somewhere else where it's easier to shop. Am I being picky? Perhaps, but I've found that if there is a barrier to sales, even a small one, it will deter some portion of customers from proceeding. To be successful you must remove as many barriers as possible. The manner in which you flip through buttons is usually inconsistent, since there are many species of vendors to choose from. Indeed, some sellers even create their own vendors with totally unique control mechanisms. This leads to the uncomfortable situation where the buttons are marked and placed differently from vendor to vendor. Sure, the vendor "works", but it's just more difficult for customers to figure out how they work. "Do I press the top button or the left one?" If you don't agree with me, consider the case where you are renting an automobile. Do you immediately drive off after getting in? Or do you take a few minutes to familiarize yourself the with alien controls? (especially if it's a Volkswagen.) Why make it difficult for customers at all? While I mentioned that some vendors are networked and provide sophisticated functions, many vendors are in fact not networked at all and do not provide any such features. Finally, in-world search scans objects marked as "For Sale" and "Include in Search". This simply doesn't work with vendors since the for-sale objects are hidden inside and don't get indexed by searchbots whizzing by. Is there a case for using vendors? Certainly - I believe you must use vendors if you happen to be prim-starved. It may be your only option on a 512sm parcel or a 30 prim mall-stall. But don't ever expect a similar level of sales as you might have had if all objects were out on display for all those reasons above. Shopping is definitely not one of my fortes. In fact, I foolishly try to build any item I need first. Or at least I contemplate building before finally giving in and undergoing a shopping ordeal. Why is it an ordeal? 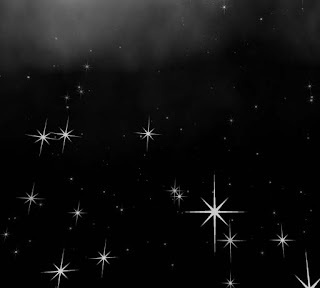 I am not exactly sure, but usually I end up doing what seems to be an endless search for something that may not even exist. It typically takes a very long time and I often get frustrated when lag slows my store visits even more. Am I being too picky? Probably. Am I impatient? Um, Yes. I wasn't looking for fish on that day, but if I did I would certainly come back to this very interesting store. Readers will recall that I often rant about store structure and organization. But this time I wanted to point out the good things I observed at Splash Aquatics. Not only does Splash Aquatics have a great selection of high-quality items that all follow the same theme and are grouped in very sensible ways, it also has a couple of interesting twists that I believe many shops should consider. First, there is a very strong element of realism throughout the area. Buildings and landscape appear just as they would in real life. But one of the most interesting realism aspects was the manner in which fish were sold. Pictured above is the "Nursery" where small fry fish apparently are spawned. To the right of the tank are buttons for purchasing said small fish. What struck me was how different this was from a typical store display. 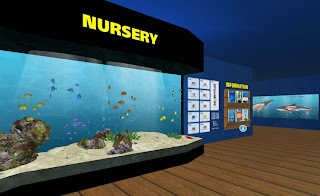 Instead of merely having an array of product boxes lined up on a wall, the nursery tank seems to bring the concept to life by showing you precisely how the product can be used. And even better, it is exactly what you would see in a real life aquarium store. Secondly, Splash Aquatics has a "feature attraction" in addition to the store product displays and stocked shelves: a walk-through fish tank. We've all seen these in real life, where you may walk in dry safety within a glass tunnel at the bottom of a large tank, watching sharks skim just above your head. You can do exactly the same thing at Splash Aquatics; their tank looks very much like real life. Having a feature attraction like the water tunnel is a tremendous idea for any store. It provides visitors with another reason to visit, and possibly show it to their friends who otherwise would have had no reason to visit your store. That's exactly how I discovered Splash Aquatics. Someday I will build a feature attraction at Electric Pixels. I've already been thinking of some ideas, but I haven't quite got the right one yet. A feature for an aquatics store might be obvious, but for particles? Stay tuned! 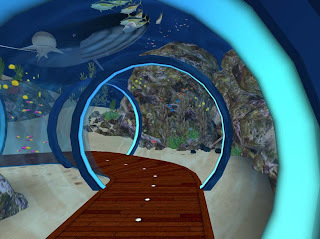 And by the way, you can visit Splash Aquatics here, in the unfortunately named sim, "Gooruembalchi".